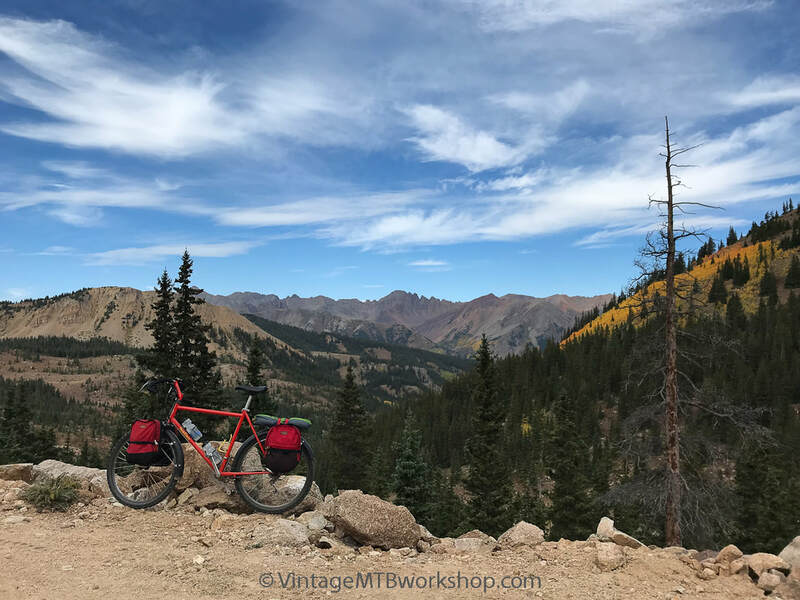 The 42nd edition of the Pearl Pass Tour held on September 8th and 9th, 2018, marked 40 years since five avid riders from California came out to join the crusty local riders of Crested Butte for this annual ritual. 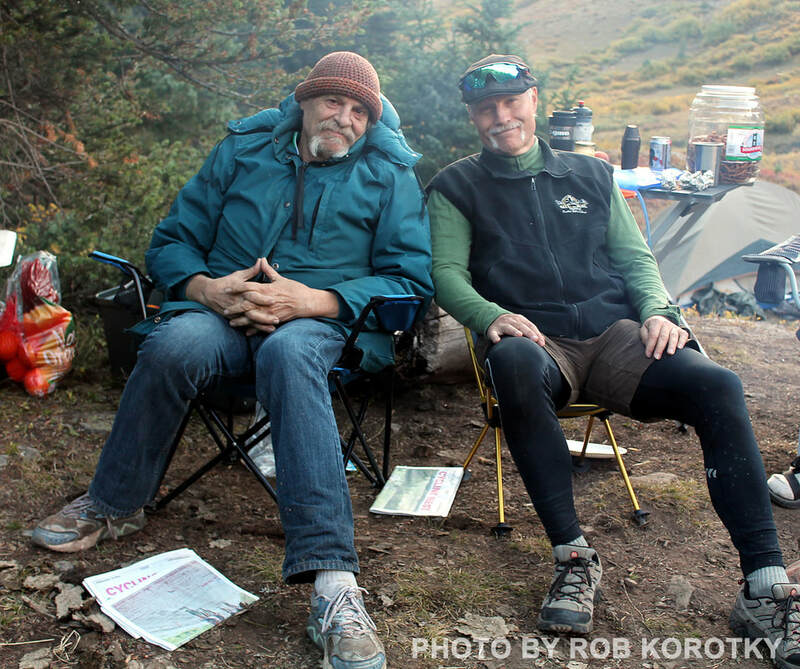 Of the original five, Joe Breeze and Charlie Kelly returned this year to commemorate the event and ride the Tour. As a result of their presence throughout the weekend, many great stories from the early days were remembered which added to the festivities. 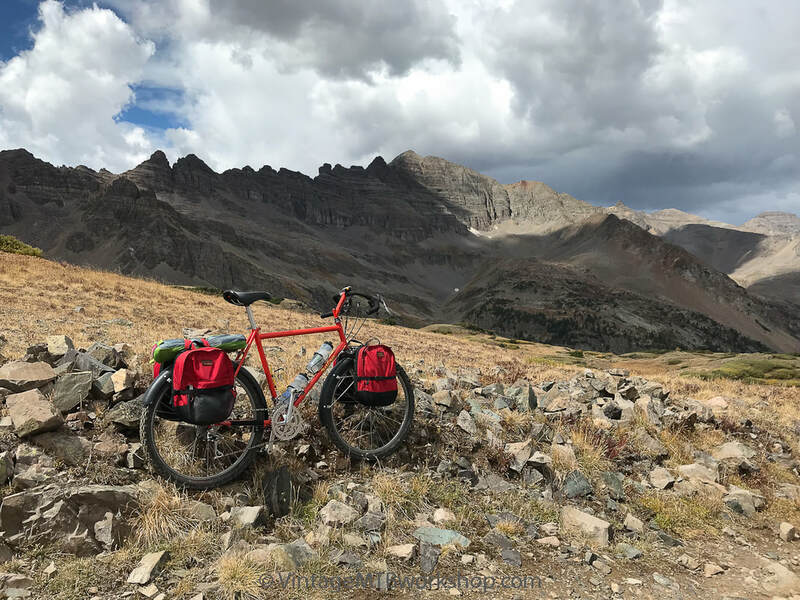 They recounted that at its peak the Tour would draw as many as 400 participants, and became a technical proving ground for riders and frame builders who were rapidly advancing the technology of the mountain bike. 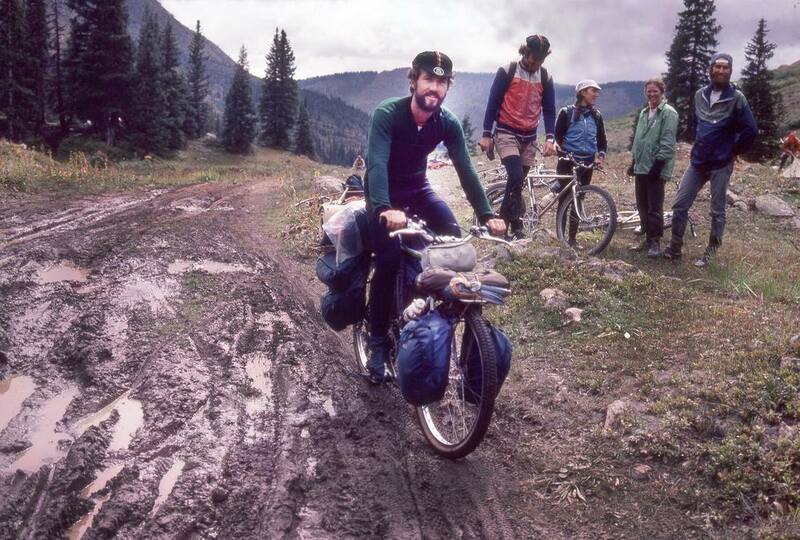 One of those early contributors was Mountain Bike Hall of Fame inductee Mike Rust, who carried all his own gear, sleeping bag and all, to Aspen on the 1980 Tour. 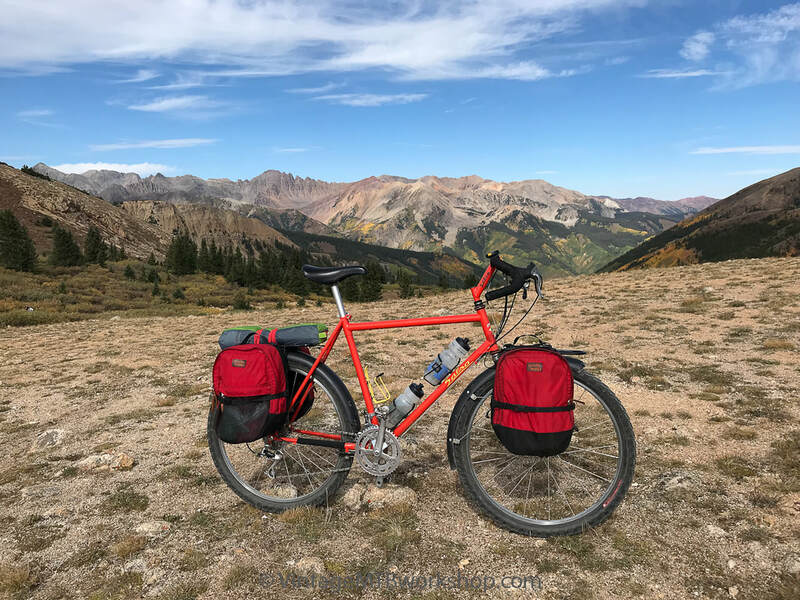 He then returned back to Crested Butte the next day over East Maroon Pass. Mike would continue to do this in subsequent years, "fully-loaded." 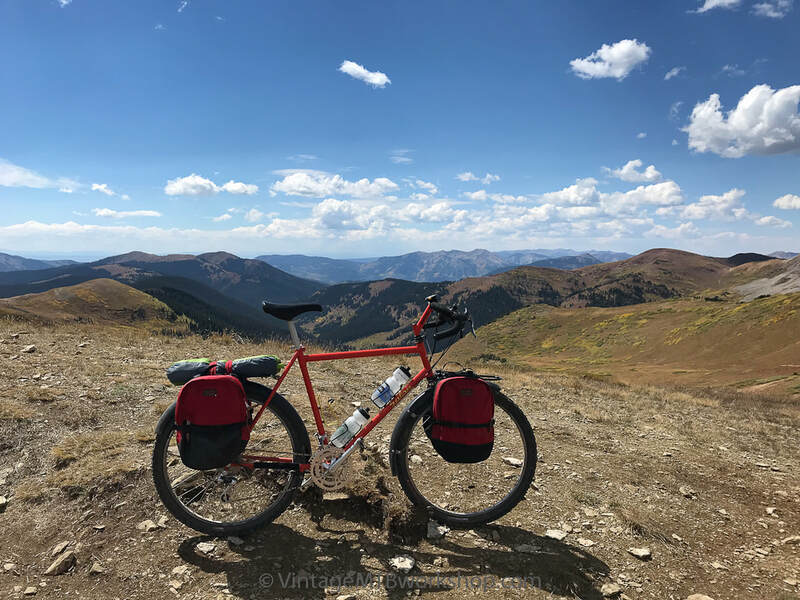 In honor of Mike Rust's efforts, the Tour this year was completed fully-loaded and self-supported on 1988 Salsa #289, which had been designed for over-night riding. 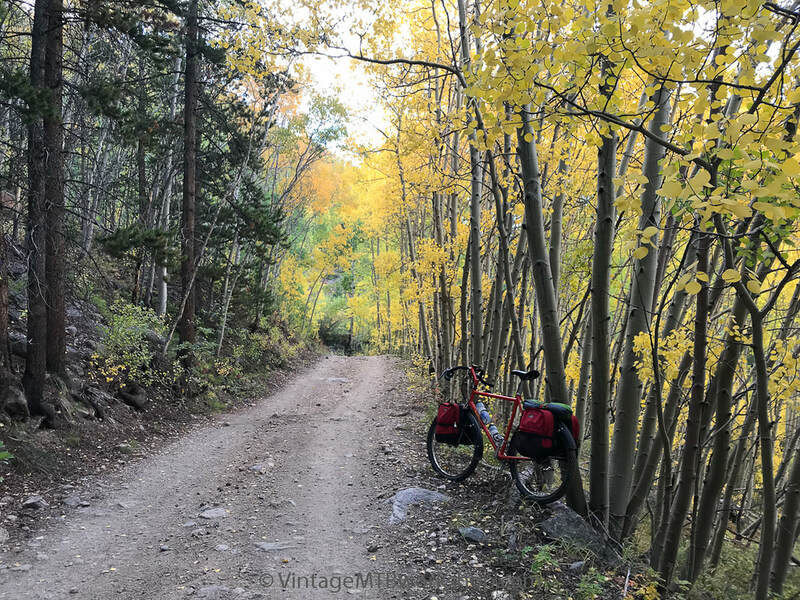 The original owner of the bike had conceived of and assembled a harmonious system of Bruce Gordon racks, Needleworks bags, Moots fenders, and durable WTB components to meet the task. 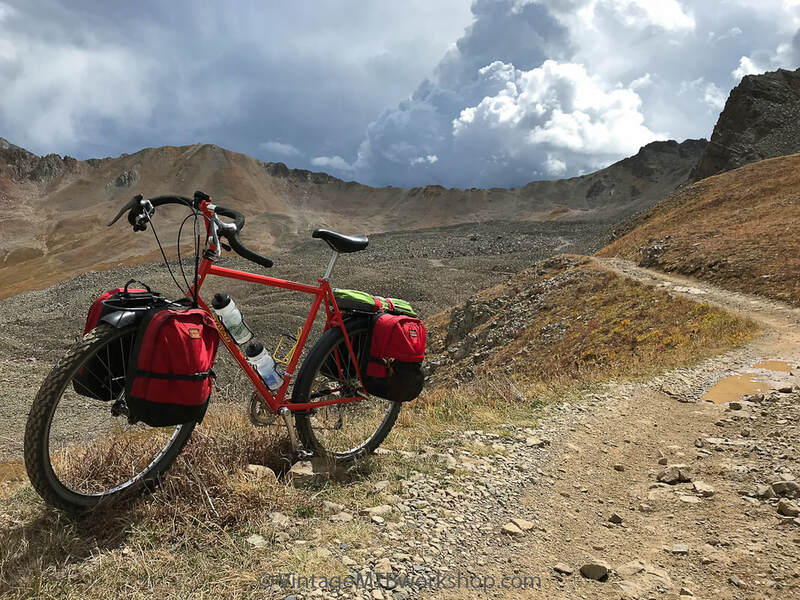 All told, the system with empty bags weighs 40 pounds, so adding 20 or more pounds of food, clothing, and ultralight camping gear made for some arduous pushing on route. 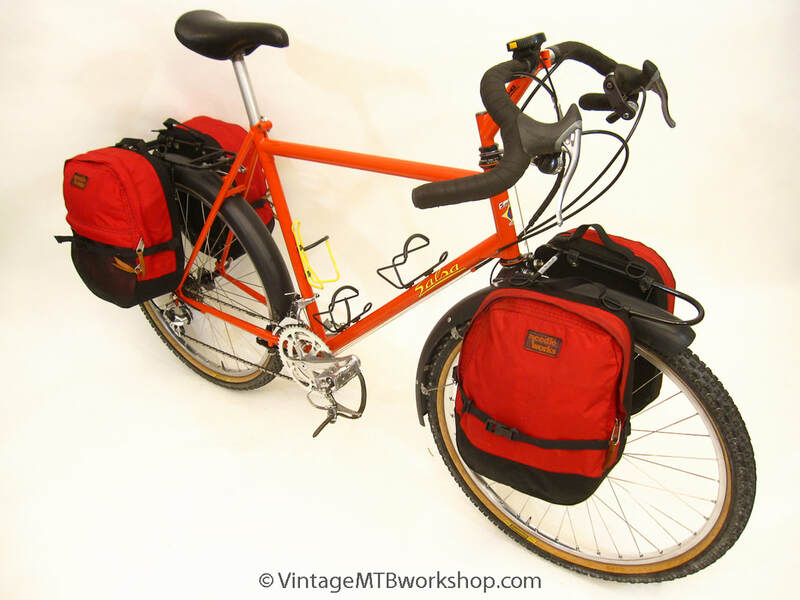 As a further reminder of how far modern bike packing rigs have come, the wide panniers were not well suited to narrow singletrack riding, although they certainly made for a stable ride. In this photo by Frank Staub, Mike Rust is shown at base camp during the 1983 Tour, with Joe Breeze and Scot Nicol in the background. 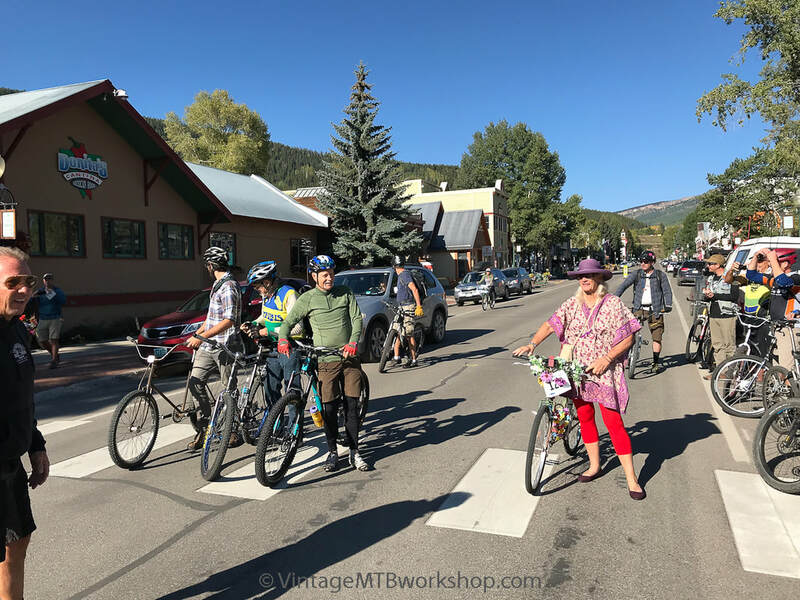 The first line up on Saturday for the 42nd Tour was reserved for riders who had done the Tour many years ago. From left to right, Don Cook, Tommy Breeze, Charles Kelly, Joe Breeze, and Glo Cunningham. Once again, the weather was warm with not a cloud in the sky on this early September day. 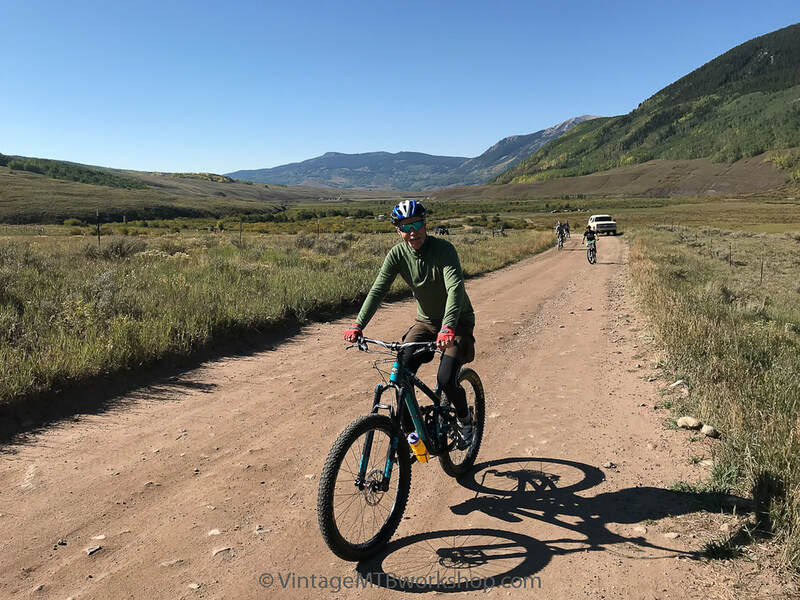 Joe Breeze heads out of the Crested Butte valley with a gaggle of Tour riders behind. 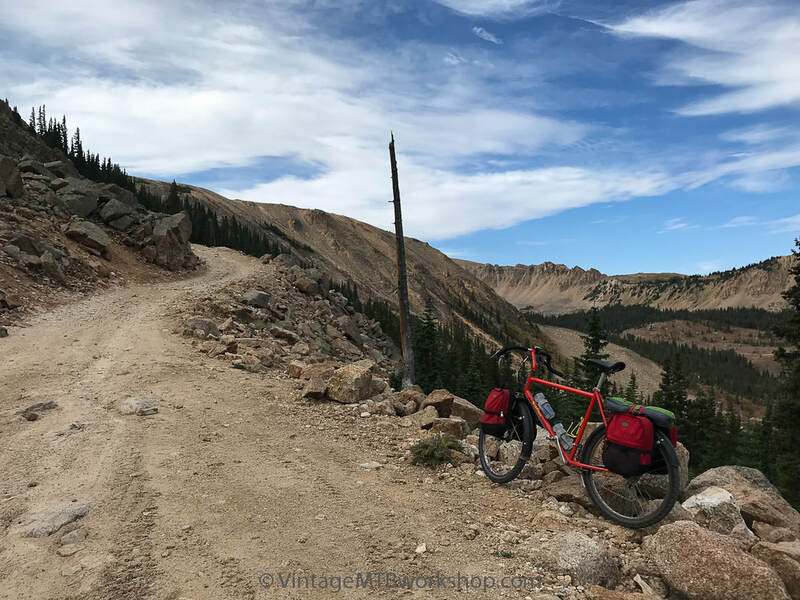 The older Chevy truck following behind would provide camping support for many of the riders and made its way up and over the rugged pass this year. 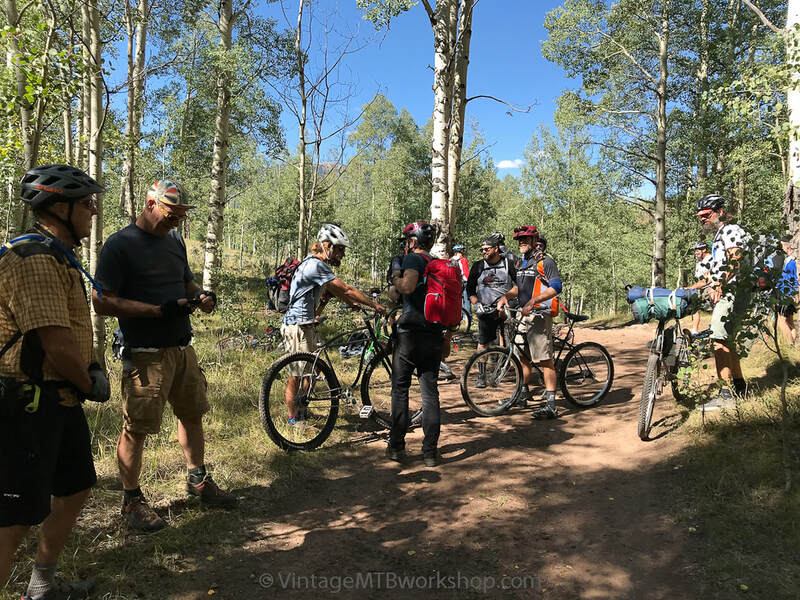 After the first water crossing and the first steep hill, the Tour regroups before the start of a short singletrack section known as Death Pass. Lots of klunkers were in attendance this year. 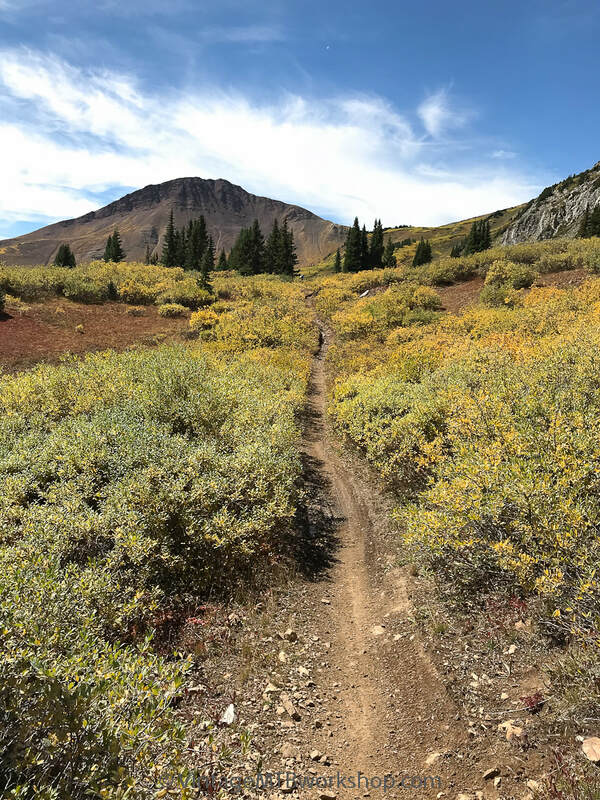 With a dry summer, the fall colors on the Crested Butte side along Brush Creek were already beginning to show. 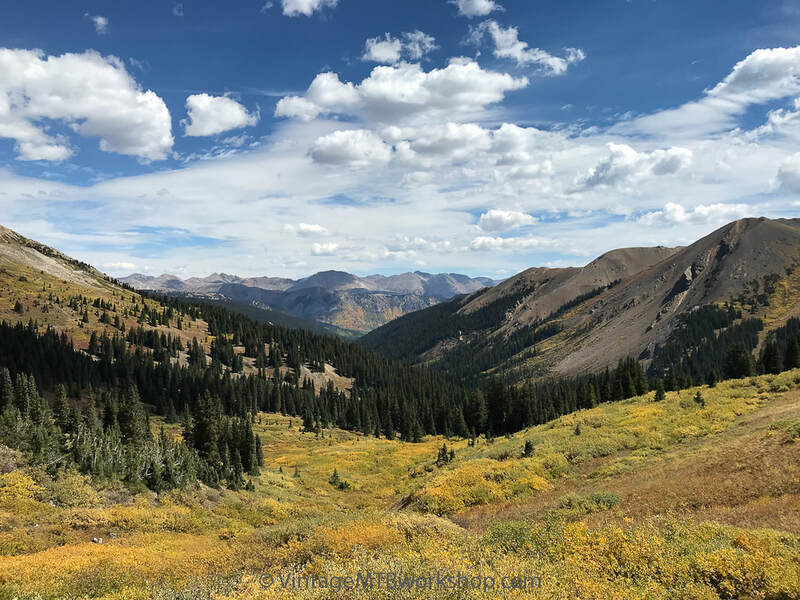 The light green trees on the hillside are aspens which have some weeks left to go to before they show their brilliance. 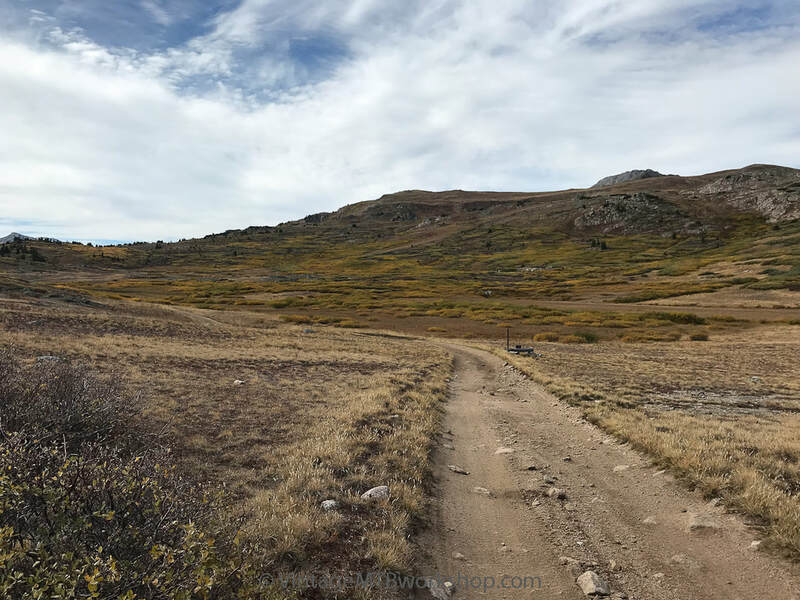 The split with East Brush Creek Trail No. 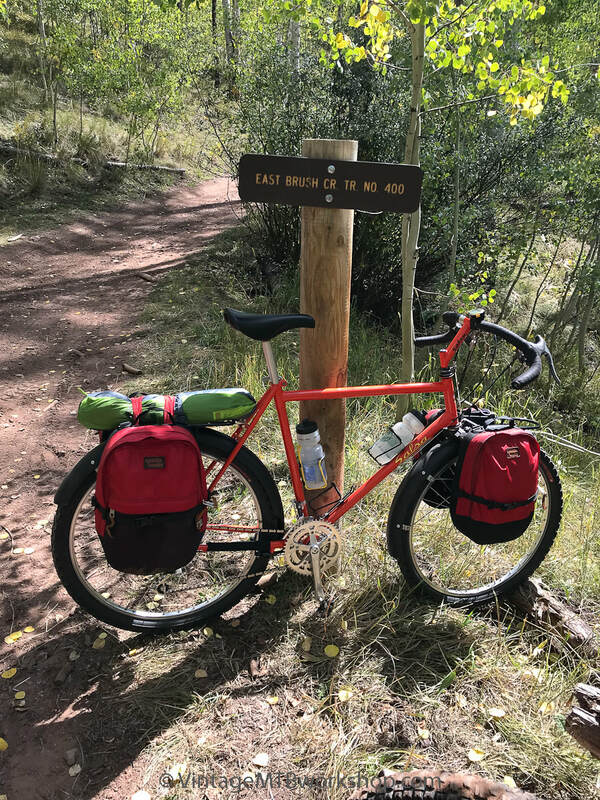 400, which marks the junction with the eventual return route from Aspen. This will be a welcome sight two days later, but in the mean time there is a lot of riding and camping ahead. Looking up at Mt. Teocalli. 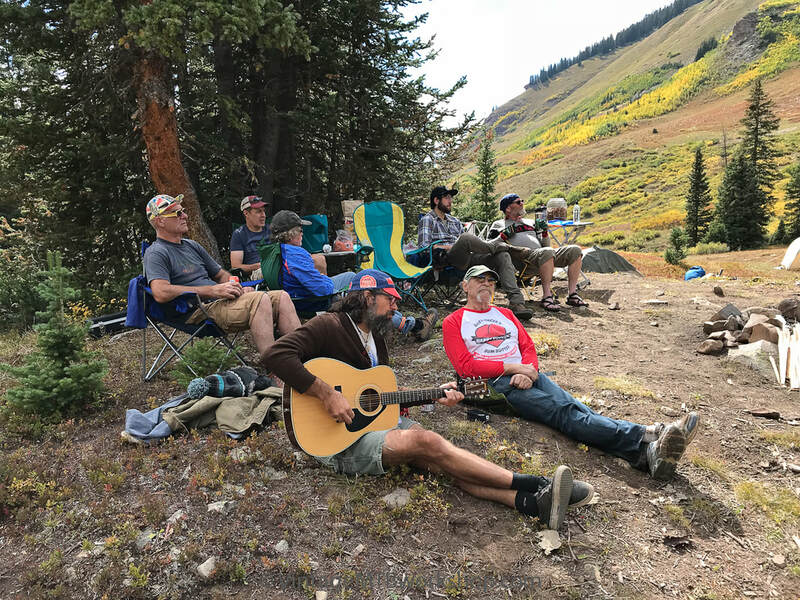 The leisurely scene at camp was a place to relax, enjoy inspiring conversations, and break out the guitar for some music. After more than 40 years, Charlie and Joe are still the best of friends. 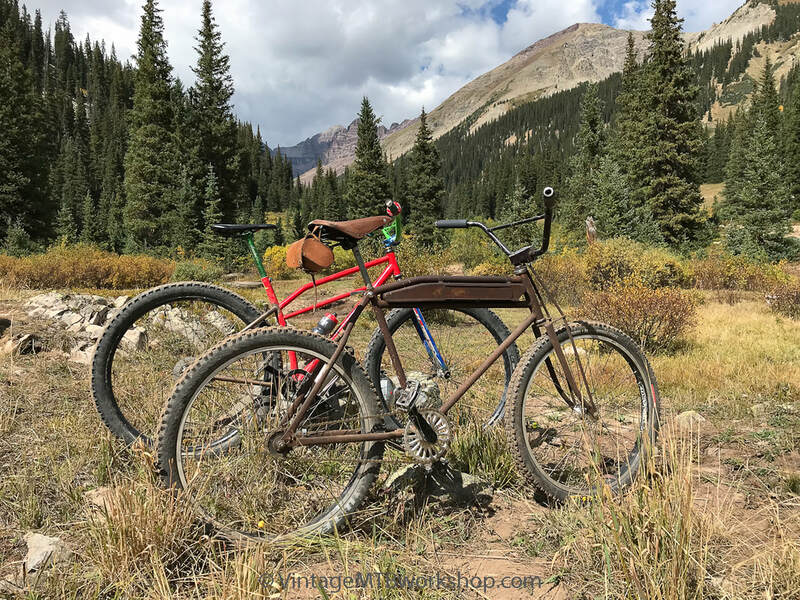 Two coaster brake klunkers at camp, representing the old and the new. The obligatory photo of a bike posed in front of the view up Cumberland Basin never disappoints. 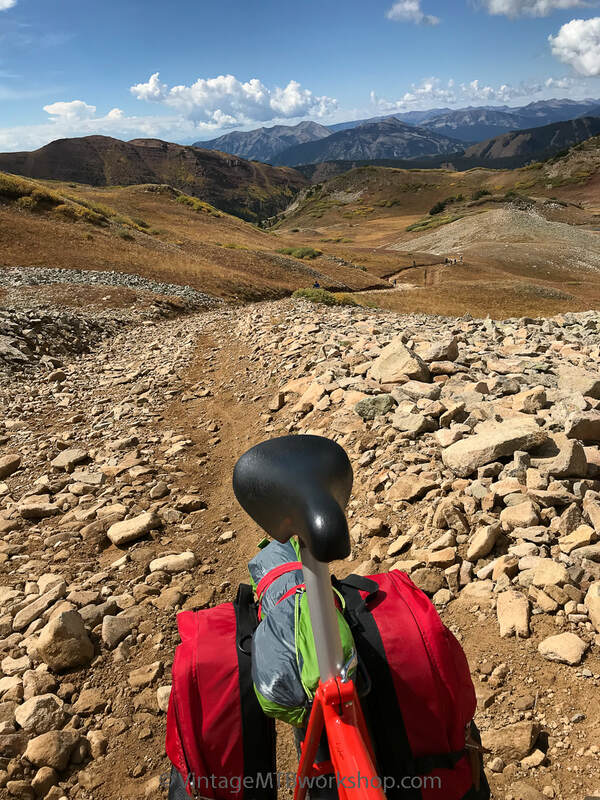 At some point, just about tree line, the riding ends and the pushing begins in earnest. It's just too steep, too loose, and too rocky. 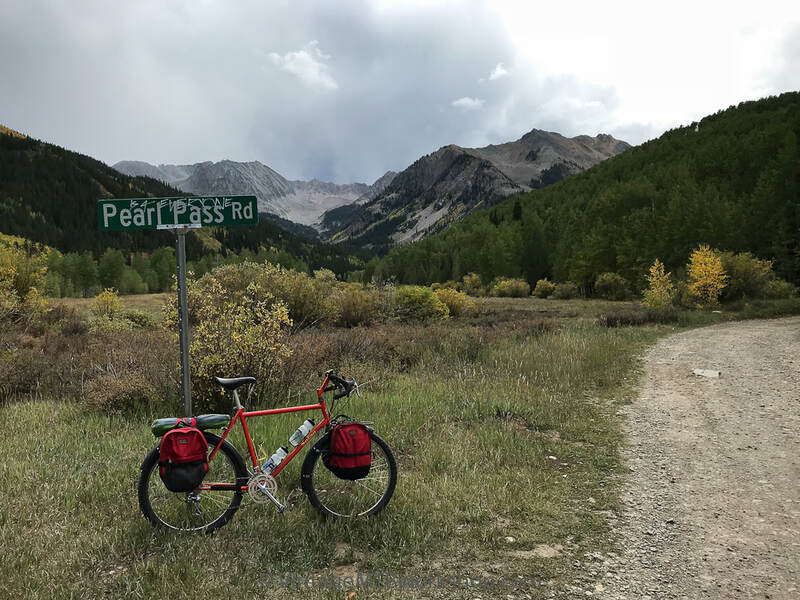 The Pearl Pass Tour is historic, scenic, and challenging, but there are much better places to go if you just want to enjoy riding your bike. 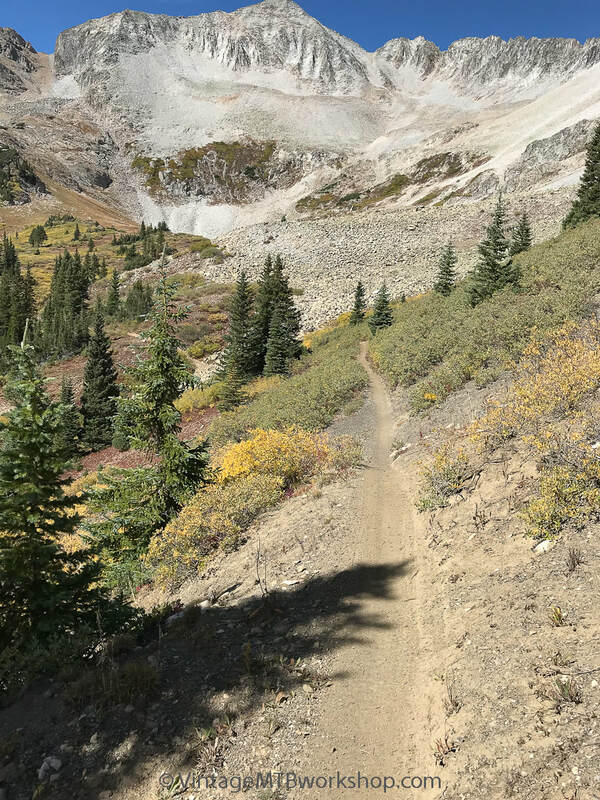 A look back down toward Crested Butte, with riders in the distance laboring their way up. At last it levels out and there is a sense of accomplishment. But wait, this is not the real summit of Pearl Pass, which is actually the low point on the horizon. 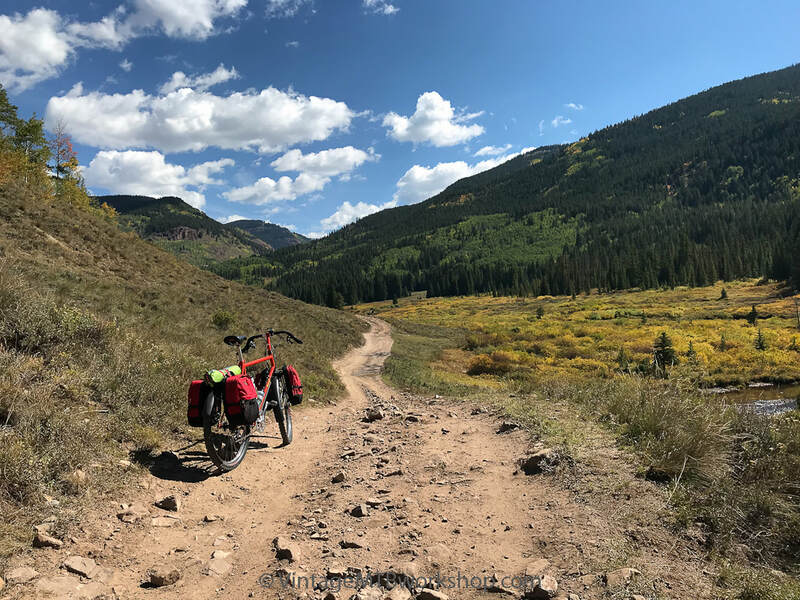 The rest of the way can be ridden, with some rest stops along the way to catch your breath and enjoy the scenery. 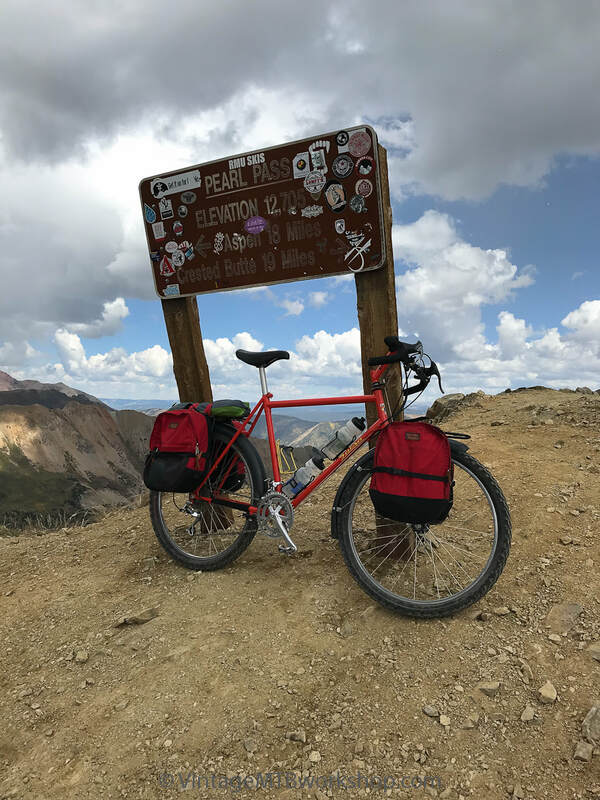 Finally, the real summit of Pearl Pass, marked with a sign that indicates the distance traveled and the distance left to go. 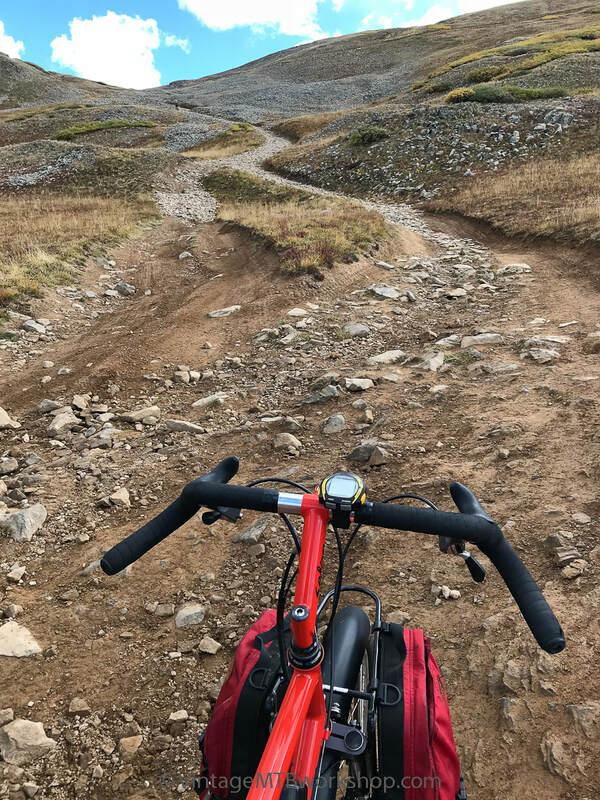 It's a relief to be at the top with a bike this heavy, and fortunate not to experience the typical snow flurries. The lunar landscape looking down the Aspen side, with the route going down the rockiest part. Often times, the sound of running water through the rocks can be heard. 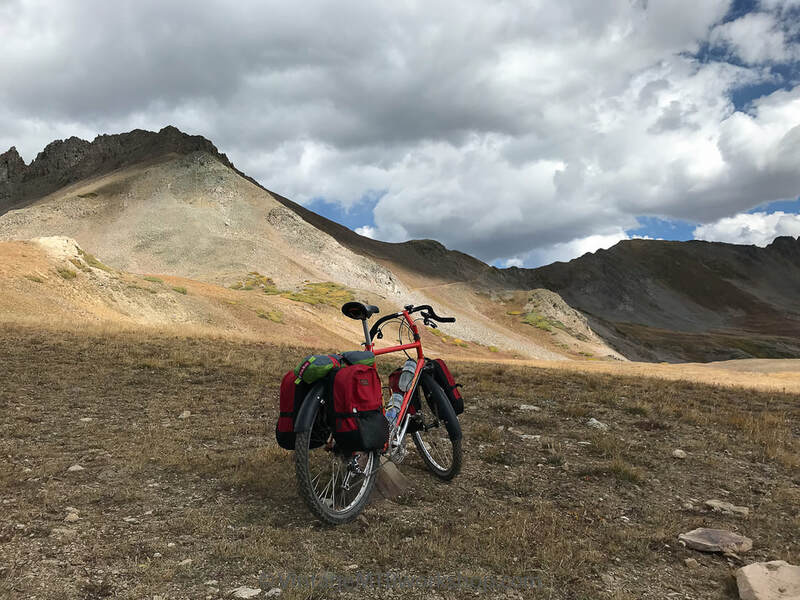 A couple of views looking back at the summit of Pearl Pass, with riders and vehicles still visible and ready to bobble through the boulder field. 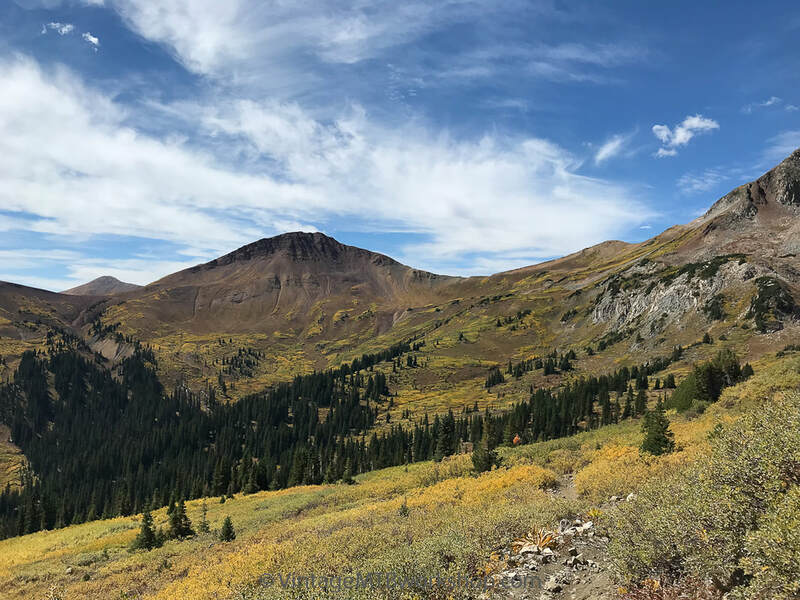 Castle Peak never fails to impress. 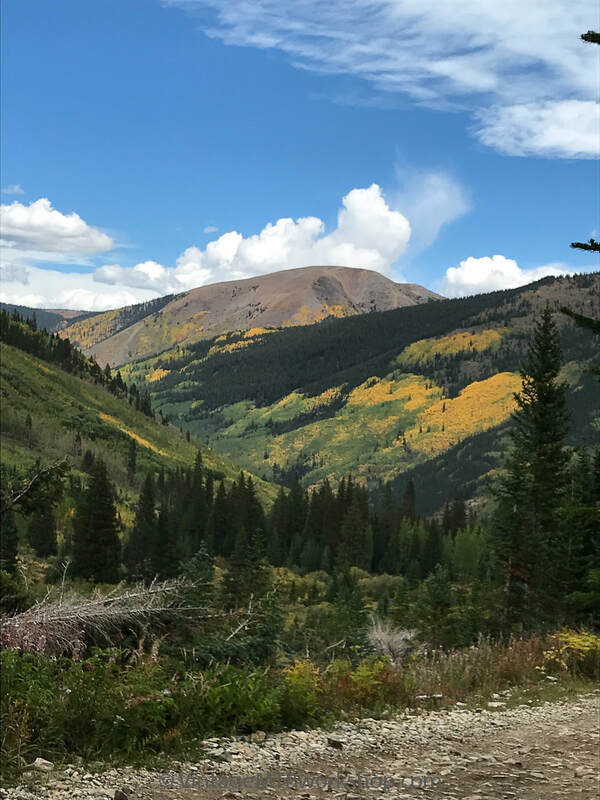 On the Aspen side, the fall colors were much more apparent. There is a reason this place is so popular with tourists. 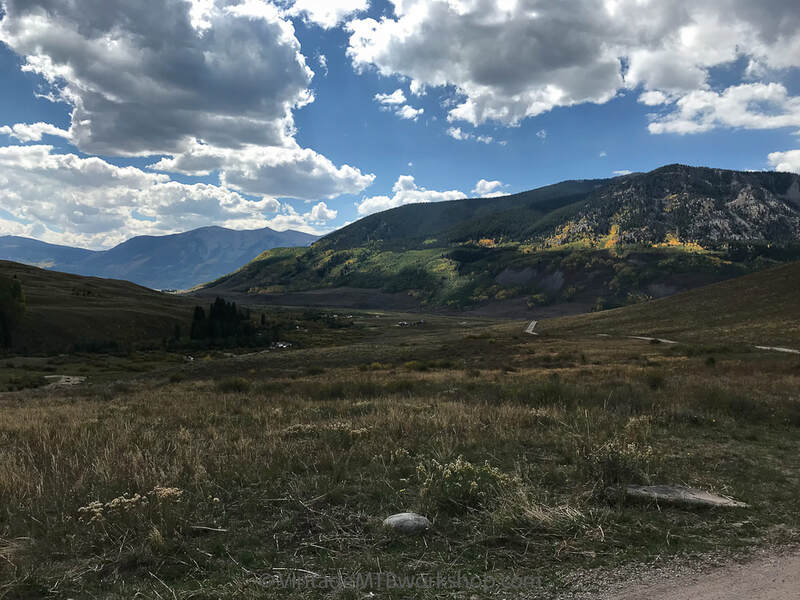 Pearl Pass Road, as viewed from the Aspen side looking back. 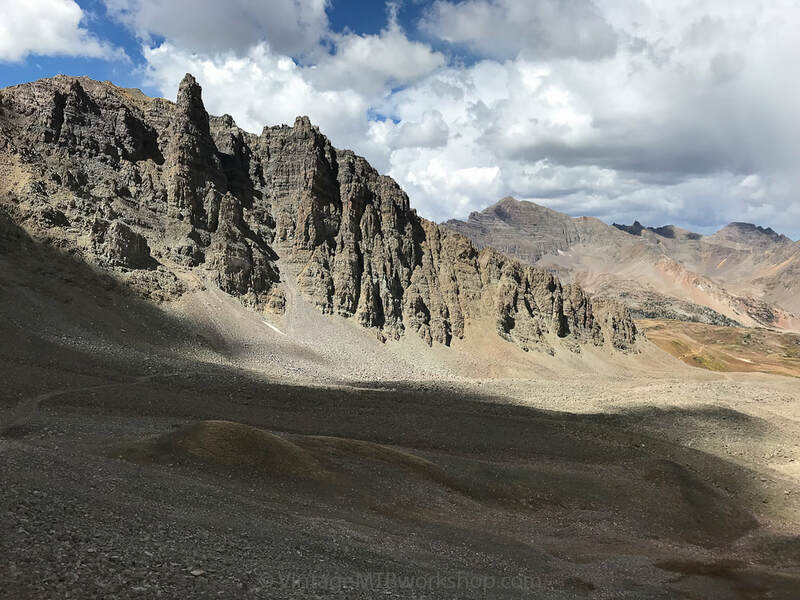 With each descent of this route, people say, "never again." And yet they keep coming back. 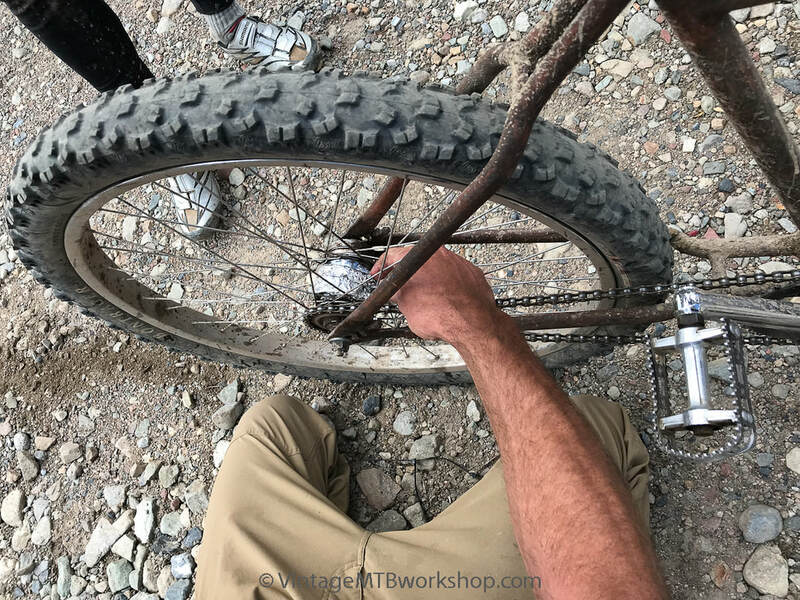 With the rocky and steep descent complete, it was time for this rider to check on his hub-bacon. Only half cooked, this was perhaps best left for the more adventurous to try. 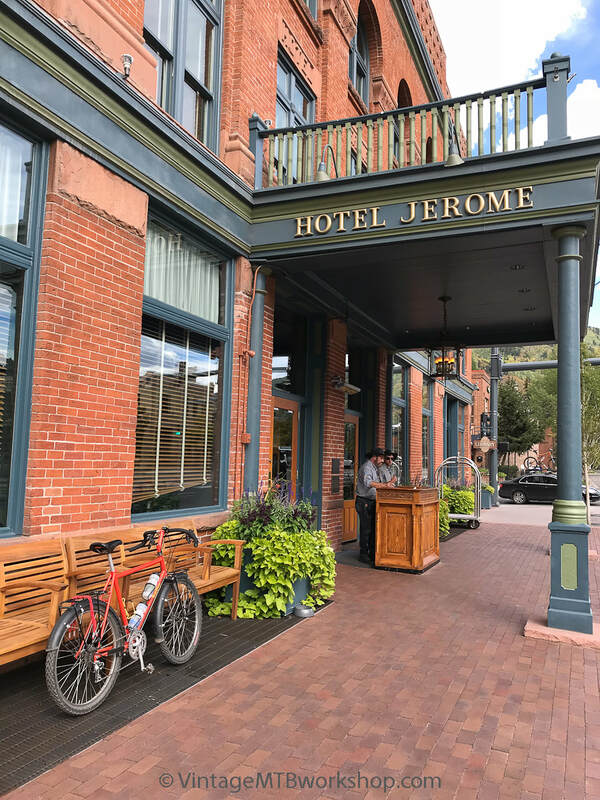 Down in Aspen, the Salsa made an appearance at the Jerome Bar and Hotel, which is the traditional end of the Tour. 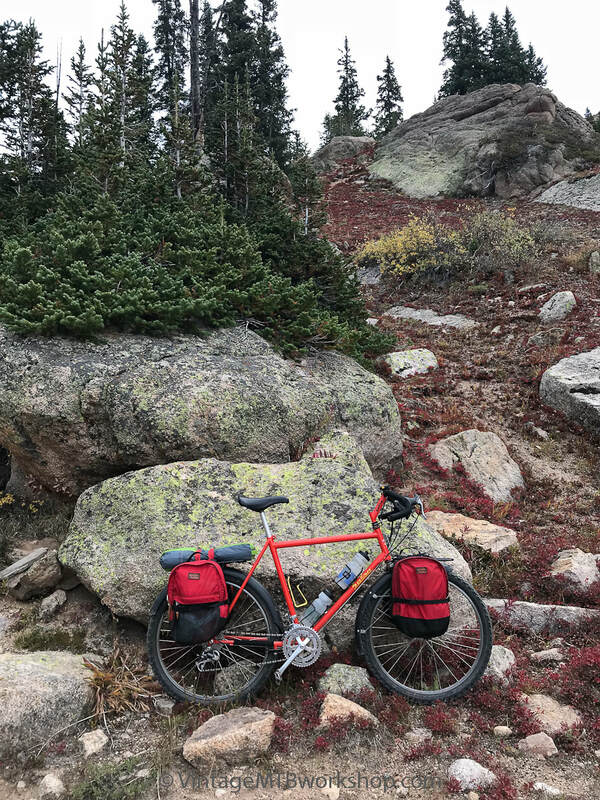 Absent from the bike are the heavy packs which were left up the road at the camping spot for the night. 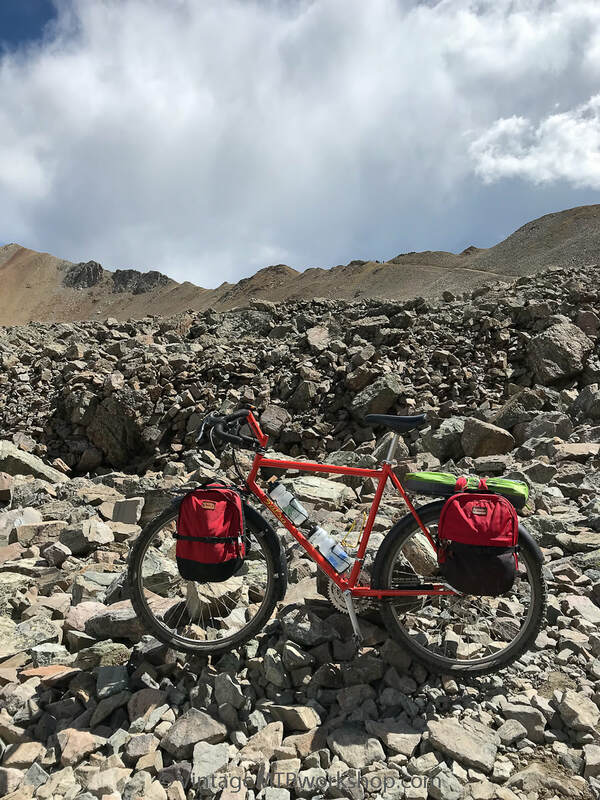 Without the weight, the bike felt spry, and maybe just a bit twitchy in the handling department. 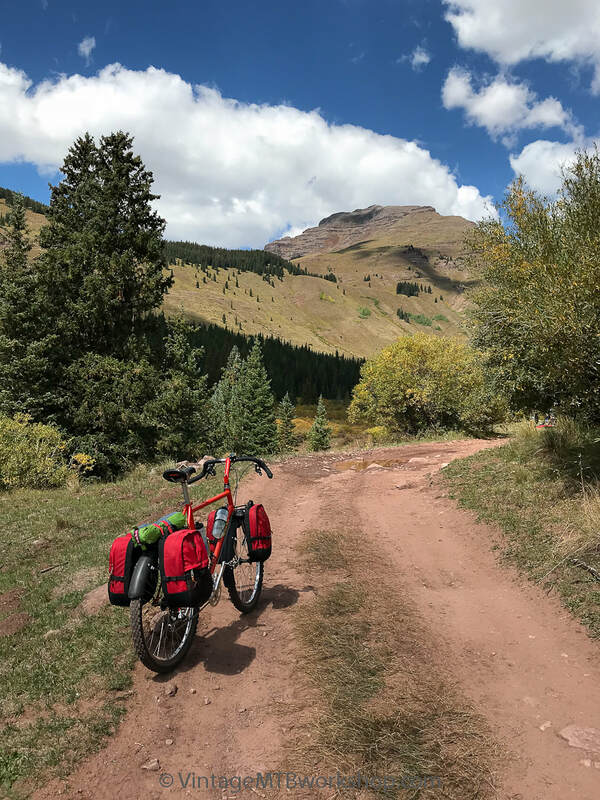 Parking in Aspen next to this Ibis Scorcher built by Wes Williams makes this up-scale community a little more inviting. 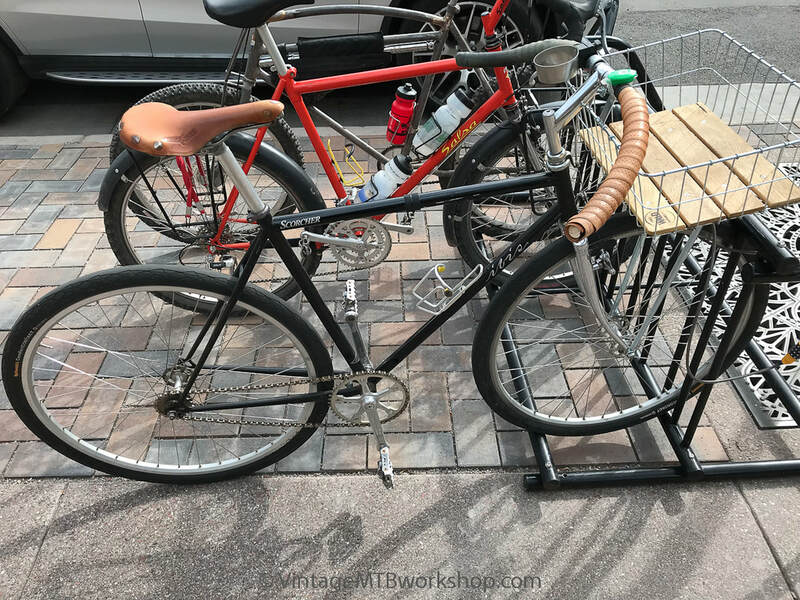 This bike looks well-appreciated, as it should be. 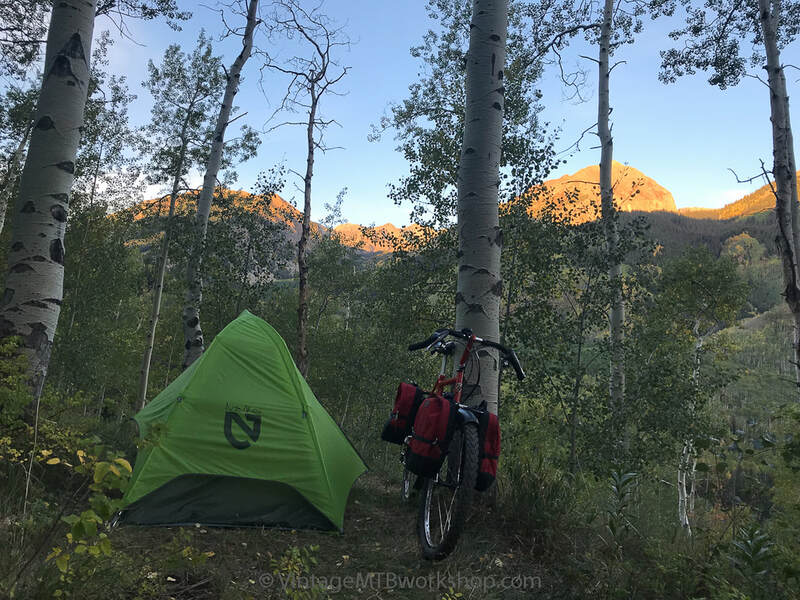 This idyllic camping spot on the Aspen side is perched part way up Express Creek road. 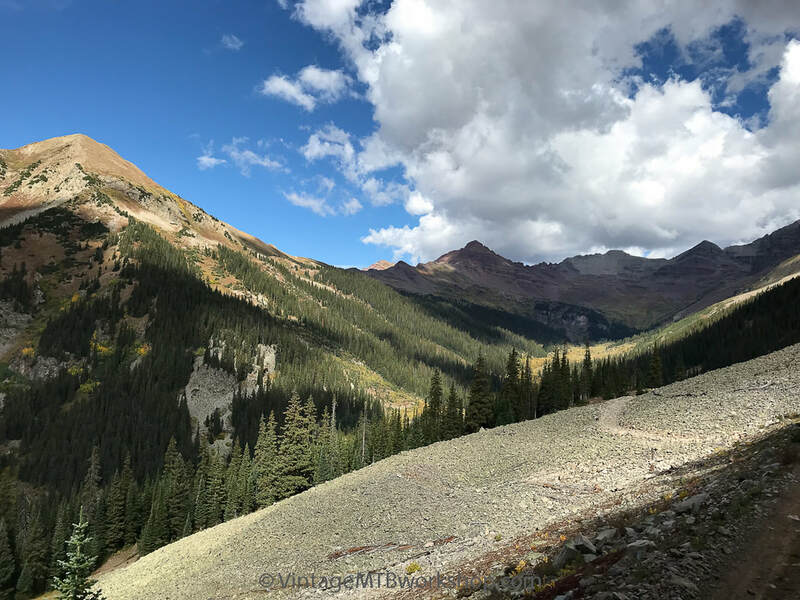 The morning light shining on the Maroon Bells - Snowmass Wilderness is a prelude to the spectacular riding that will unfold later in the day. 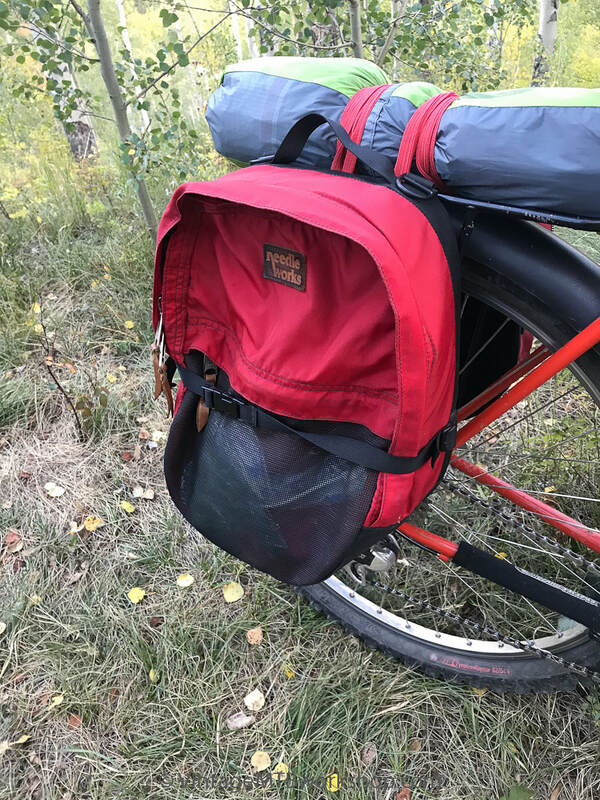 After two days on the trail, the food bag is starting to look a little empty and all the more lighter for the challenging terrain ahead. 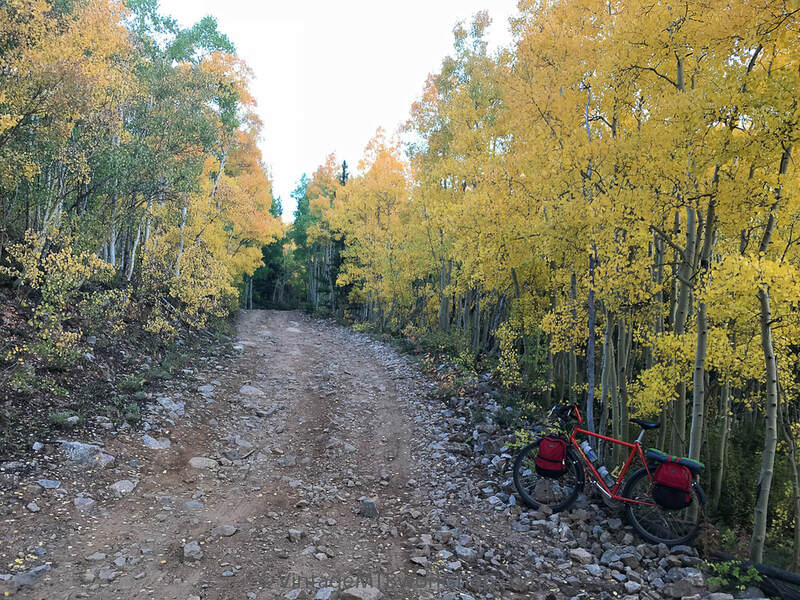 Surrounded by the fall colors of Colorado on the ride up Express Creek Road. 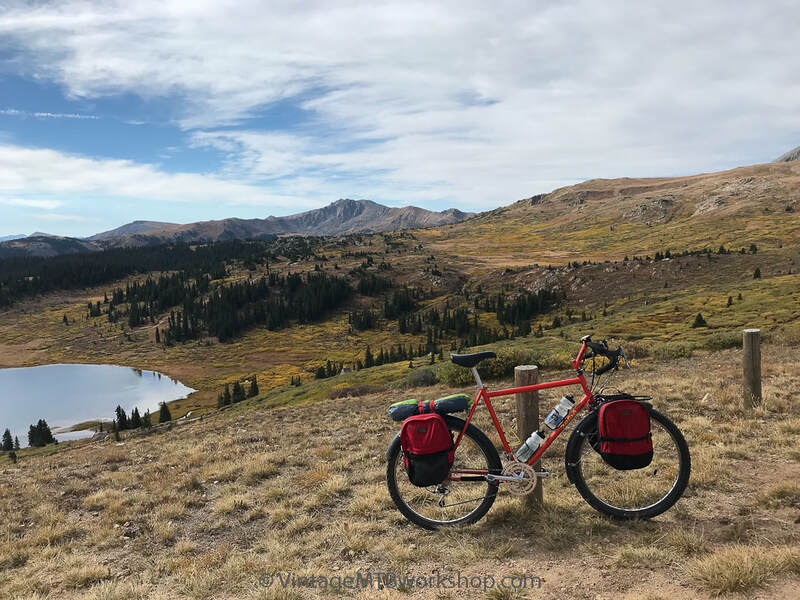 The final stretch up Taylor Pass is strenuous, but the spectacular scenery begins to unfold. 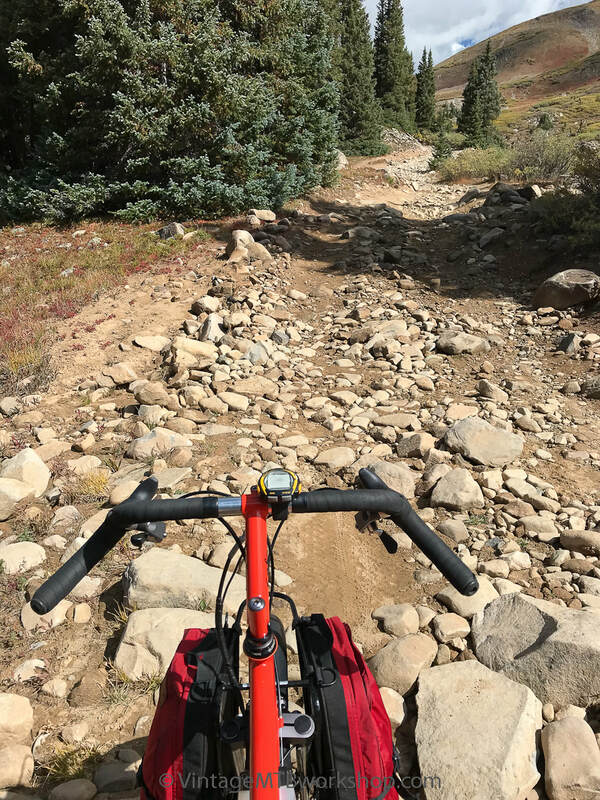 On steep grades like this, a heavy loaded bike needs low gearing, but the excessive weight also provides good traction both in and out of the saddle. That said, some pushing is always involved. 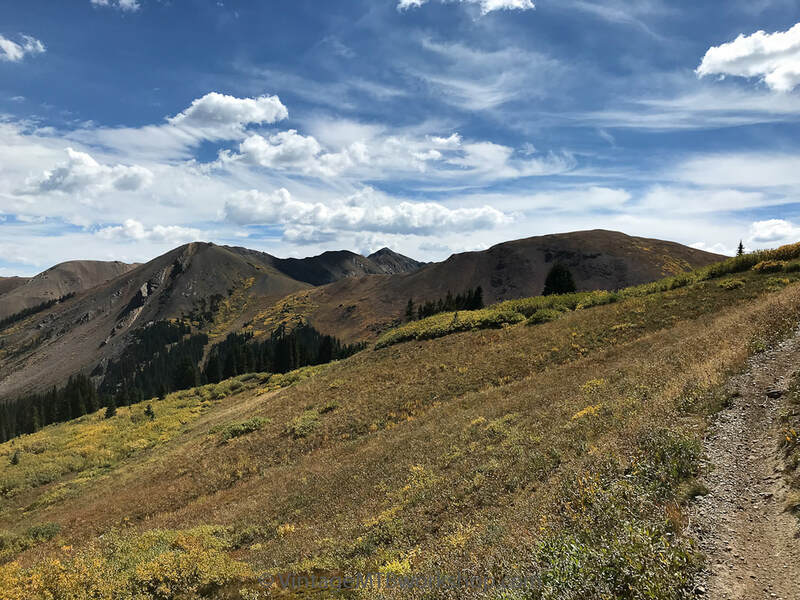 The views from the summit of Taylor Pass are beautiful in all directions. 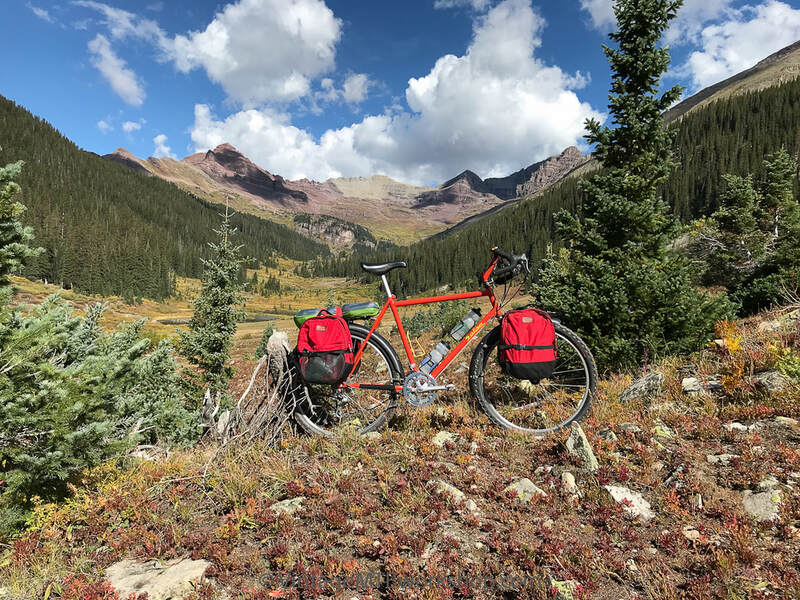 The scenery on the approach to Star Pass is evidence of why we long to ride in places like this. 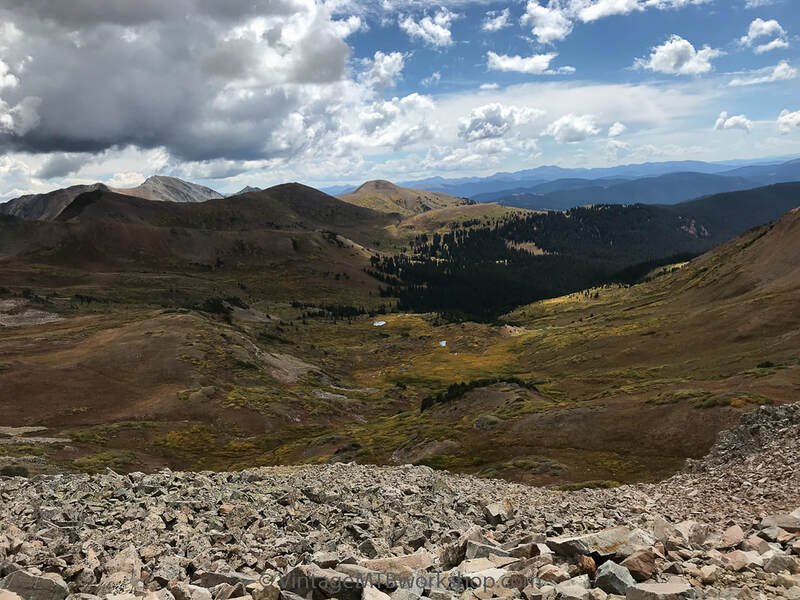 At last, the summit of Star Pass, looking toward Mount Crested Butte in the distance and the final destination. It was all downhill him from here. 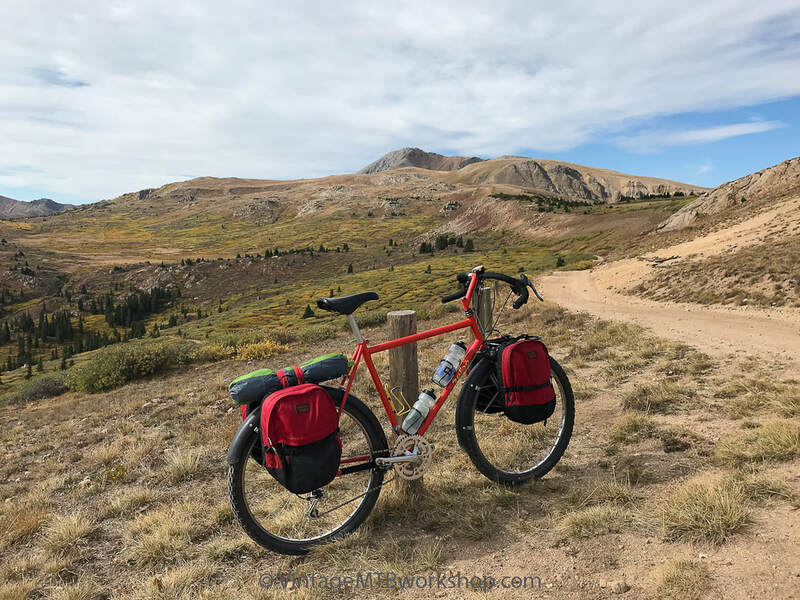 Dropping back into the Crested Butte valley, the colors seemed more brilliant after a few days on the trail, and a fitting conclusion to yet another Pearl Pass Tour completed on a vintage mountain bike.